Composed by J.F. 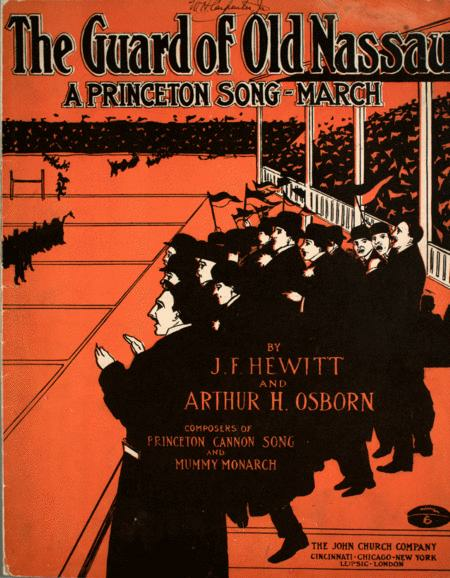 Hewitt & Arthur H. Osborn. Football, Silhouettes, Crowds, Universities & colleges. Lester S. Levy Collection. 7 pages. Published by Johns Hopkins University Sheridan Libraries (LV.15660). The Guard of Old Nassau. A Princeton Song March. By J.F. Hewitt and Arthur H. Osborn. Published 1907 by The John Church Company in Cincinnati. Composition of sectional with piano and voice instrumentation. Subject headings for this piece include Football, Silhouettes, Crowds, Universities & colleges. First line reads "When you see a team in black and orange, It's the guard of old Nassau. ".